From Eurasia Staff | Ich bin ein Sender. Ich strahle aus! | I am a sender. I transmit! In 1967 and 1968 Beuys staged Eurasia Staff. 82 min fluxorum organum. One important phase of this performance is documented in this multiple.1 Derived from a photograph by Ute Klophaus, the work depicts Beuys pressing the contents of a margarine container into the space behind his knee. While performing this gesture, he has placed his right foot, to which he has strapped a piece of iron, on top of a piece of felt on the floor beside him. 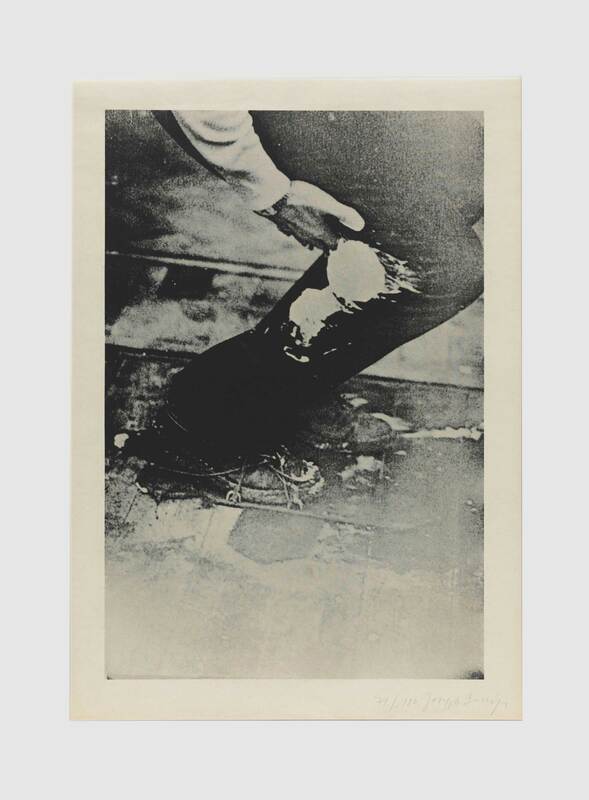 Printed humbly on newsprint, the image shows the cylindrical clump of margarine dripping from the rear of Beuys’s knee, his hand slapped forcefully against his thigh. The deep flexion in his knee joint serves to dramatise the contact between the layers of felt and iron beneath his foot, intensifying their connection to one another. Together, these gestures encapsulate two related themes in Beuys’s art: his interest in intuitive experience as an alternative to rational thought, and his wish to bring about a balanced relationship between a range of opposing entities and energies. Beuys believed that intuition was a form of experience that, in contrast to brain-centred reason, could arise at any site within the body. It is for this reason that he sometimes remarked ‘In any case, I think with my knee’. In applying margarine to his knee in the Eurasia Staff performance, Beuys was symbolically coating it with a substance he regarded as a bearer of spiritual warmth, a form of energy he regarded as the source of creativity and change. 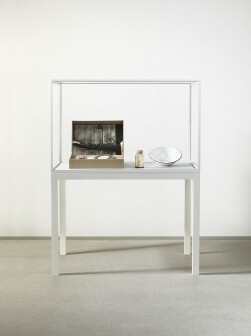 The second act depicted in this multiple also alludes to warm energy, as stored and transmitted in the felt sheet beneath Beuys’s foot. 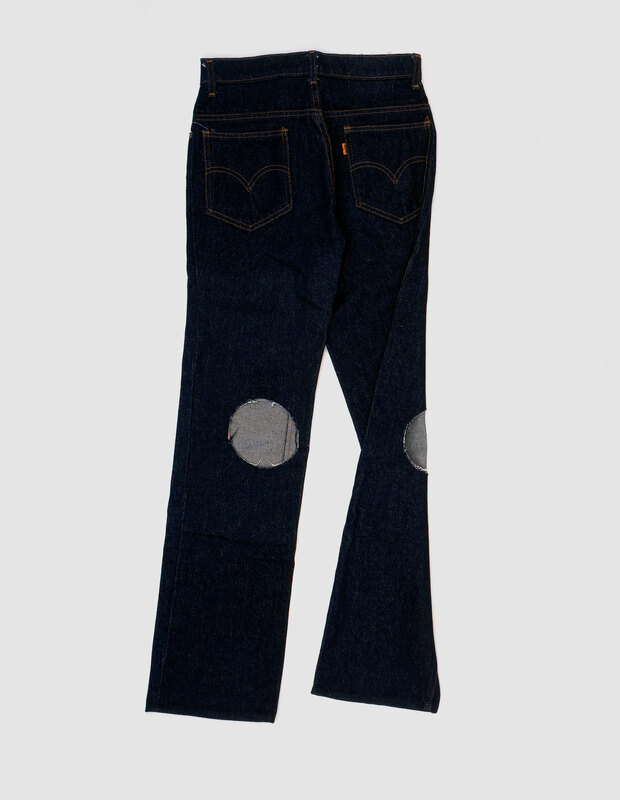 These warmth-bearing properties were opposed in Beuys’s thinking to the ‘cold’ and rigid qualities of iron. 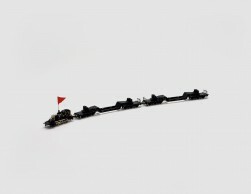 He also opposed the two materials on a range of other fronts, linking felt, for example, to intuition, and iron to rationality.2 In view of such contrasts, it is important that in From Eurasia Staff they are stacked on top of one another in the form of a cross. Beuys used the cross, among other things, to signify a fusion of opposing qualities within the context of a greater, more balanced whole. Only by reconciling opposites, he believed, could progress and social evolution be accomplished, an aspiration encoded in this charged material encounter.